SITUATED IN THE famous 8th arrondissement, adjacent to the Parc Monceau, sits one of Paris’ most striking architectural treasures, the Pagoda. With its crimson red exterior, jade-green roof tiles capped with Chinese gargoyles, and its latticework windows in imperial yellow, the building stands as an exclamation mark among the rows of grey and white Haussman-style buildings. When I first arrived on its doorstep in August 2011, the gate was locked and it appeared unoccupied, possibly even abandoned. But today, after extensive renovations and planning, the gates are open and the building is alive again with the art and culture of Asia. Originally constructed as an hôtel particulier in the Louis-Philippe style, the building was acquired by Mr. Ching Tsai Loo, otherwise known as C.T. Loo (1880-1957), a celebrated collector and dealer of Chinese and Far Eastern art and antiques, in 1925. 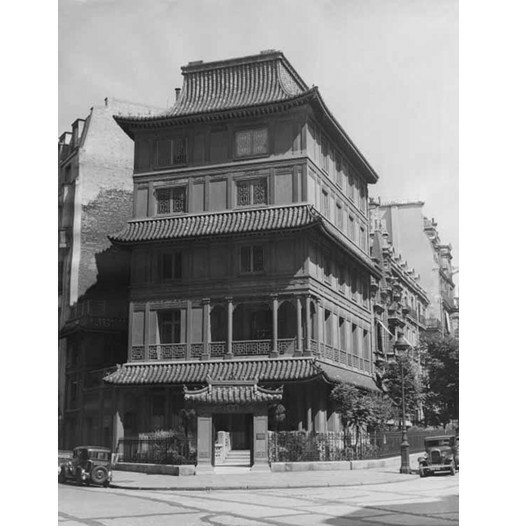 With the help of noted French architect Fernand Bloch, Mr. Loo laboriously redesigned the building into the Asian-styled architectural landmark we know today. Given its unconventional appearance, one can only imagine the impression that this building must have given a contemporary visitor to the building. As a young Chinese immigrant to France, Mr. Loo worked his way up from humble beginnings to become one of the earliest and most highly regarded Asian art dealers in the first half of the 20th century. Taking advantage of his privileged connections in China, in 1908, Mr. Loo founded an antique firm under the name Lai-Yuan & Co. in Paris. During this period he was almost single-handedly responsible for introducing important early Chinese art – bronzes, jades, paintings – to the West. Working between Europe and the United States, Mr. Loo was instrumental in advising and acquiring objects for many prestigious private and institutional collections, including those of J.P. Morgan, John D. Rockefeller Jr., Charles Lang Freer, Samuel Peters, Alfred Pillsbury, and Henry Clay Frick, among many others. The Pagoda was Mr. Loo’s gallery for the 50 plus years he was in operation. 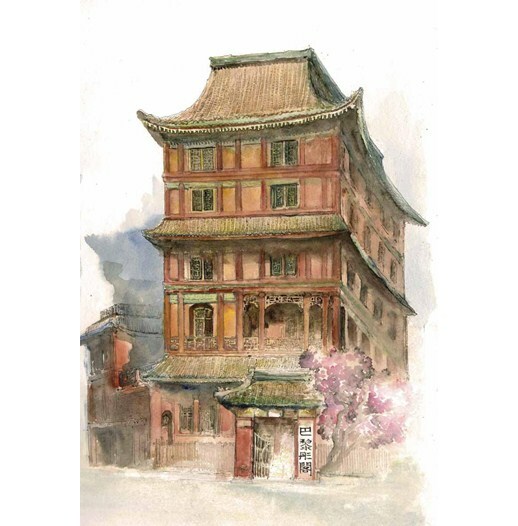 This historical building not only housed an incredible collection of paintings, furniture, porcelain, objects d’art and works of art spanning the dynasties of Chinese and Far Eastern art and antiques, it was also Mr. Loo’s family residence for nearly a century. 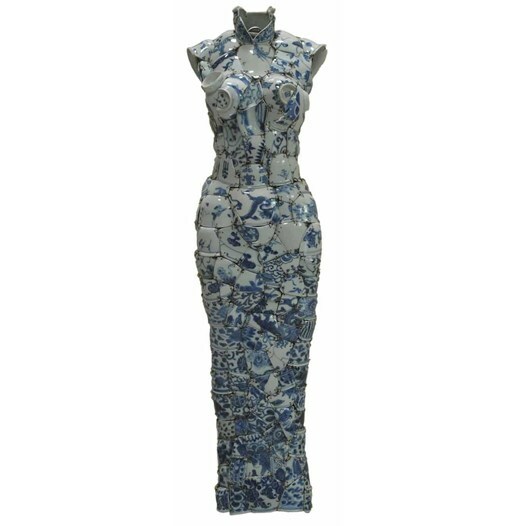 In the late 1940s, Mr. Loo gradually retired from active business, and from 1948 onward his Paris gallery, C.T. Loo et Cie, was under the management of his daughter Janine Loo. After C.T. Loo passed away in 1957, his children and grandchildren continued the Asian antiques business at the Pagoda. However, given increasingly restrictive international import regulations, limited access to new material, and the clearance of Mr. Loo’s inventories of art, it became more difficult to fill the Pagoda. In more recent times, the building was put on the market and was purchased by a private French investor in 2010. Now under the new direction of Jacqueline Baroness von Hammerstein-Loxten, the building has been elegantly renovated and given new purpose as an art and event centre. Given her conservation activities and architectural modernisation accomplishments, the director will be awarded the Medaille d’Honneur from the Fondation Prince Louis de Polignac in December 2012. With renovations just completed, this mid-October, the rebranded Pagoda Paris has re-opened to the public. Anyone who crosses the threshold into its interior will be rewarded with a unique and refined space that is both Asian and Western. With approximately 800m² and its five levels, the interior environment is a museum in and of itself. Its 16th- and 17th-century lacquered wood panelling, an art deco glass ceiling depicting Chinese characters, an 18th- and 19th-century sculpted wood galleria of Indian origin, a lacquer and wood elevator, will make you feel as if you have found yourself in another time and place. In addition to the Pagoda’s lavish and eclectic Asian architectural elements and furnishings, it is also possible to access Mr. Loo’s private library, with access to some 2,000 books and 3,000 catalogues related to Asian art, and his correspondence and photographs, as well as original art archives, by appointment for research purposes. By hosting important exhibitions and sales of Chinese and Asian Art, both contemporary and antique, the Pagoda Paris aspires to honour Mr. Loo’s legacy and become the premier space in Europe for Asian art. 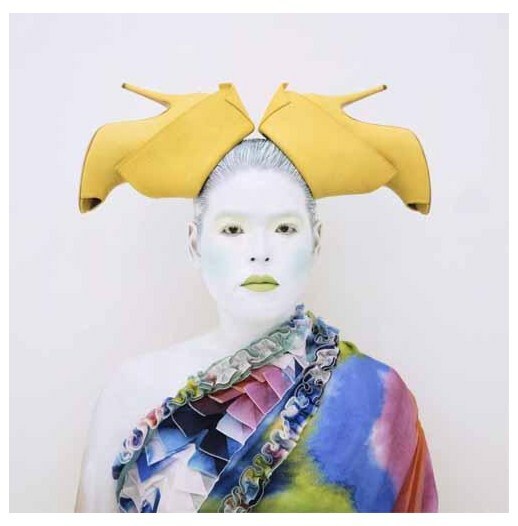 The inaugural exhibition from October to December 2012, L’Asie en Vogue presents a major public display of contemporary Asian artwork and antiques around the theme of textiles and costumes. With art media as diverse as photography, ceramic shards, buttons, stainless steel, and pencil shavings, the exhibition features the work of eight established and emerging pan-Asian contemporary artists, each exploring themes of identity, tradition and culture through his or her own unique visual art language. A poetic unveiling of the building itself, through the presentation of contemporary art along with museum-quality textiles, the Pagoda is exploring how today’s Asian artists weave and stitch together meaning in their art, and how the past and present are intertwined. The Pagoda Paris is a veritable treasure-trove of history, and is one of those rare places where art and environment can complement and inform each other. More than just a gallery or event space, the Pagoda Paris has as its purpose to promote informed understanding and the mutual exchange of ideas between the diverse communities of Europe and Asia. It is my great honour to help contribute to this dialogue by curating their first exhibition in the renovated space and I look forward to welcoming you.